We are now living in a world of constant change and disruption. We can either see the world as a threat to or a limitless resource to engage, stimulate, and cultivate our imagination. In a globally networked world, information is getting easier and easier to access. What you actually do with that information is the new challenge. 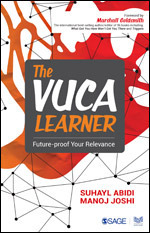 The answer to all these questions is TheVUCA Learner: Future-proof Your Relevance. As the world grows more complex and uncertain, opportunities for people with critical thinking, innovation and imagination are on the rise. Organizations are only as good as the people they employ. To stay relevant and grow in this unforgiving business environment, one needs to develop a learning mindset, where continuous lifelong learning becomes a daily habit, to let go of the old and become agile, adaptable and resilient.